Winter wilderness | Sommerberg Hotel Bad Wildbad, Herzlich Willkommen im Panoramahotel über dem Enztal! Another foot of snow overnight ensures a record winter for snow since I arrived in 2006. 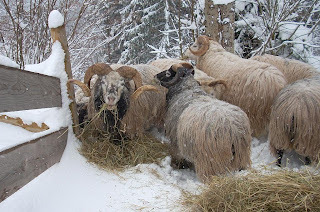 Meanwhile the sheep tuck into their daily breakfast of hay, their only food source when snow covers the hillside.